"Oktoberfest Giant Extra Large Beer Mug, 35 Oz." "Almost as big as the Alps and capturing the spirit of the iconic German festival for which it is named, our Oktoberfest giant extra-large beer mug is large enough to satisfy any thirst. 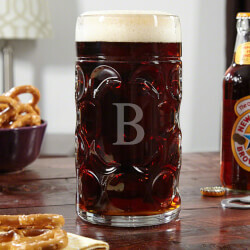 Holding a massive 35 ounces of bier (German for beer), this glass beer stein can optionally be engraved with the initial of your choice. It is made from extra-thick glass, giving this mug added durability. The dimpled design is styled after traditional beer garden mugs, making it a unique and eye-catching addition to your home drinkware. No matter if youre doing the Chicken Dance in lederhosen or sitting back to simply enjoy a REALLY tall cold one, our Oktoberfest beer mug is a must-have for any serious beer drinker.Made of extra-thick glassHolds 35 oz.Measures 8 tall and 6.5 diameterOptional single initial personalization"